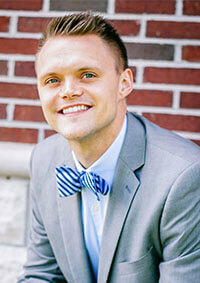 Dr. Jordan Burns was born and raised in southern Indiana. He grew up in Oakland City, where he enjoyed many years of basketball, football, soccer, and track and field. Being involved in so many extracurricular sports is where he first realized how his love for sports performance and fitness could lead to a career. Fulfilling a childhood dream, Dr. Burns attended Indiana University-Bloomington where he received his first Bachelor’s degree in Kinesiology. While being a member of the men’s track and field team at IU, he suffered from back pain after a weight lifting incident. After going to a local chiropractor for the first time ever, he was finally pain free after his adjustment. He decided to switch career paths after researching and experiencing the benefits of chiropractic care firsthand. Dr. Burns then moved to St. Louis, Missouri where he attended Logan University-College of Chiropractic, graduating with a Bachelor’s in Life Sciences, a Master’s in Sports Science and Rehabilitation, and his Doctorate of Chiropractic. While at Logan, Dr. Burns was accepted as a Senior Intern in the Biofreeze Human Performance Center, a clinic that specializes in sport specific injuries and rehabilitation. Dr. Burns is board-certified by the National and Indiana Boards of Chiropractic and has enjoyed successfully treating patients in pain. He uses a variety of specific chiropractic and therapy treatment protocols that allow him and his qualified staff to provide a gentle, effective approach to many different muscular, neurological, and joint-related conditions for people of all ages. In his personal life, Dr. Burns makes a valiant effort to practice what he preaches. He enjoys staying active by weight-lifting, running, and playing basketball. He also loves cooking and he cherishes spending time with his girlfriend, family and friends. Whether you are in pain or wanting to learn more about how you can be more proactive with your health, schedule an appointment with us so we can help!